The air vent is one of my favorite mounting locations. I like it because it keeps the device right where it’s convenient for you to see it. I also like the fact that it keeps your device out of clear site of any potential bad guys. Car air vent mounts are not clearly seen in a parking lot versus a traditional windshield suction cup mount or one for the dash. Most dash mounts are easy to install. Depending upon the vent mount, some are easy to remove (and some are not). Car air vent mounts are excellent for mounting a cell phone, GPS or small tablet. Although there are a few good vent mounts made for tablets, you need to ensure that your vents can handle a larger heavier device. I have seen a few cases where the weight of the tablet pulled the vent slats out of the dashboard. Although I would wonder why that would happen in my car rather than blame the mount, I would simply recommend avoiding the vent for heavier items. 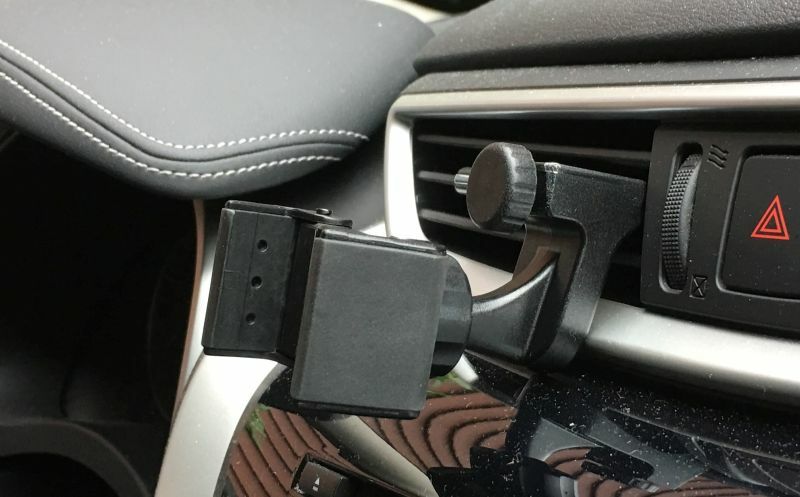 Although I was always a bit concerned about the heat or air conditioning blowing extreme temperatures on my device, I never had an issue using car air vent mounts with either a GPS or a smartphone. Been using these types of mounts for over ten years, never had an issue. Vent mounts come in two flavors. The first uses two arms that grasp on to your vent slats. These mounts are inexpensive and easy to install. The arms will insert into the vent base and you will pinch the end of each arm to insert it over the vent slat. Removal is typically a matter of pinching the end of the arms, slide forward slightly and remove. They work great on horizontal vents, meaning the slats run from side to side. Vertical vents are another story. Car air vent mounts have been around for over ten years and the majority are made using the arms just described. Finally manufacturers are making mounts that include a small clamp on the back. Typical installation involves turning a small knob to open the clamp, placing it around a vent slat, then tightening the knob so the mount holds tightly. Mounts with clamps work on all vent types. Vertical vents and round slats no longer matter. These vent mounts are more expensive than the type described in the prior paragraph but for ease of installation and removal as well as being able to fit all vent types, the few additional dollars worth it. These types of mounts are just hitting the market and I suspect that we’ll be updating this review over the coming months as the new models hit the market. One with a small clamp as a gripper is the Square Jellyfish Jelly-Grip Car Air Vent Mount. That’s the one in the photo that accompanies this article. The Square Jellyfish Jelly-Grip mount can be used to hold most phone models with or without a case or skin. It has a ball and socket so the cradle so has the capability to be oriented downwards towards the driver versus the roof. This mount will work on flat vent slats that are 3/8 to 1 inch deep. The included cradle opens to 3 5/8 inches which is fairly large. The Square Jellyfish Jelly-Grip mount can also be used for a Garmin GPS. All Garmin vehicle GPS devices made over the past ten years include a custom cradle that has a 17mm socket on the back. Remove the cradle from the Jelly-Grip mount and you have a 17mm ball. Just snap the Garmin cradle onto the Jelly-Grip mount minus the cradle and your GPS can be mounted to the air vent. We reviewed the Square Jellyfish mount in detail in 2016 and have used it in a Nissan Murano successfully. So if it works on a Murano, it works almost anywhere. Meanwhile, iOttie is a company out of the US that makes some well made mounts. They recently introduced the iOttie iTap Car Mount Magnetic Air Vent Mount that will work using a clamp type of attachment just described. iOttie combines the mount with a magnetic ending (this is another trend that is becoming popular). A small metal plate with an adhesive backing is provided which will adhere to the back of your device, and that metal plate will attach to the magnetic mount. These work real well with a smartphone or GPS device. Another interesting trend in car air vent mounts is the molding of a series of clips directly onto the back of the mount. The Kenu Airframe Portable Smartphone Car Mount is distributed by a company called Kenu and will hold onto both horizontal and vertical vents. Although I prefer the mount just described from iOttie, these are minimalist in design, easy to install, and very simple to carry with you on vacation. So small that it will simply slip into your pocket. You know we like universal mounts, and this universal cradle opens wide enough to fit most phone with a case or skin. Lastly, Garmin themselves introduced the Garmin Air Vent Mount in 2014. For unknown reasons, Garmin didn’t have car air vent mounts available when they first introduced vehicular GPS devices. This one is a really well made mount that has an integrated clamp and control wheel. While I have never been a fan of Garmin made mounts, I do like this one. They did a nice job in the design and it is well made. The mount features the Garmin 17mm ball which fits the back of any socket that is part of a Nuvi or Drive cradle. Your cradle is still likely attached to the suction cup mount included with the GPS purchase. If you are unhappy with the suction cup mount provided, consider their vent mount. You can’t go wrong with car air vent mounts. They are inexpensive and last a long time. Coupled with the line of sight advantage that a vent mount provides, I recommend these over the typical windshield location suction cup mounts.